West Point Lodge No. 877 has its geographical roots in Revolutionary times as by perusal of narratives of the period we learn that Generals Washington, Patterson and Putnam, Colonels Tupper, Hull and others participated in the deliberations of Washington Lodge. This body met, among other places, at West Point, New Windsor and Garrison. Thus the settlement then known as Swimstown, later Buttermilk Falls, then Highland Falls, became identified with Revolutionary and Masonic history. It is not until 1869 that records of the Masonic movement again appear in this com­munity, now named Buttermilk Falls. Although no permanent organization resulted we learn that a group composed of Darius Truesdell, Charles H. Fitchett, James Denton, William Speller, George M. Sinclair and Theodore Lloyd held meetings and rehearsals of degree work. Another impulse was ,given to the movement during the period 1875-76 when a number of instructional meetings were held in the old Star Hotel on Schneider Avenue. Among the craftsmen of that day were David G. Warwick, Michael Schneider, G. M. Sinclair, Lunsman, William Speller, Andrew Munro, Ezek C. Carpenter, Joseph Cook, Reverends Joseph Mellett and Marvin R. Lent, Franz Groshans, John B. Brosseau, William Faurot, Doctor John Munro, William Saunders, Charles H. Fitchett, James Denton, and John Worthington. Active steps were taken to form "West Point Lodge" but failing to obtain the consents of all of the neighboring Lodges the movement did not bear fruit. A determined representation was made to Grand Lodge in 1884 by Thomas P. Scott, Joseph Cook, Timothy Driscoll, Franz Groshans, Jacob Foster, John Kreutz, John B. Brosseau and Jerome Denna to obtain a dispensation for a Lodge to be known as Mohegan Lodge. Again owing to the lack of consents from all Lodges affected, the movement was halted. During the 1890's there were Masonic stirrings but no definite re­sult was obtained. The victory march finally started in 1908 when having obtained the approval of all Lodges affected: Standard No. 711, Monroe; Courtlandt No. 34; Peekskill; Phillipstown No. 236, Cold Spring; Jerusalem Temple No. 721, Cornwall; Lorillard No. 858, Tuxedo; and Stony Point No. 313, Haverstraw, the founding fathers of West Point Lodge peti­tioned Grand Lodge. Disaster almost struct in December 1908 when the petitioners were confronted with information from Grand Lodge that further investigation would be required. Fortunate­ly, the petitioners satisfied General Lodge and the dispensation dated August 9, 1909 was granted. The effort of forty years had been crowned with success. To these first officers and members of West Point Lodge we of the present day owe a tremendous debt of gratitude. They worked, wrote letters, held conferences with Grand Lodge officers, held numerous meetings, and spent lavishly of their time and money to obtain the precious dispensation. 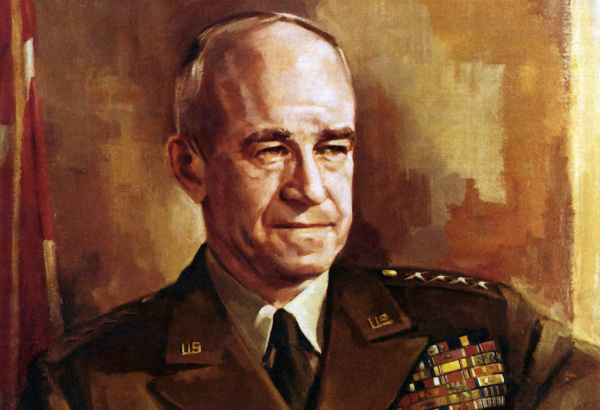 General Omar Bradley played a major part in the Allied victory in World War II. He was the last 5 star General and first General selected Chairman of Joint Chiefs. Graduated West Point class of 1915 numbered 164. 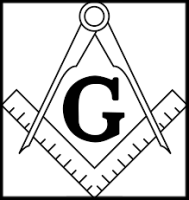 Raised a Mason in 1923 in West Point Lodge #877, Highland Falls, New York.